The IST Course Unit Quality System is aimed at following up the functioning of each course unit, by promoting responsible involvement of students and teachers in the teaching, learning and assessment process. 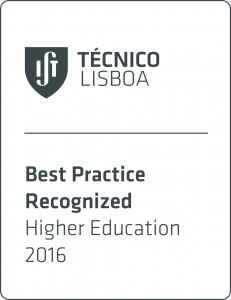 In 2016, QUC system was recognized as a Best Practice in the thematic field Higher Education of the IST Good Practices Observatory (ObservIST). Soon you will be able to find information on the Manual of Good Practices, which comprises some of the conclusions that relate to the functioning of the QUC (Course Unit Quality System). Should you have any doubts on the functioning of the system, please go to the FAQ, or email us to cp@tecnico.ulisboa.pt. The completion of the surveys, related with the subjects of the 1st semester of 2018/19, is already available to fill in and it’s open until the end of the enrollment period of the 2nd semester (scheduled for the end of February 15, 2019). Poster with global results of the 2nd semester of 2017/18.